Do you wish your computer, video game console, or media streaming device had a faster and more reliable internet connection? Do you have no interest in paying someone hundreds of dollars to run Cat6 cable through your walls and install Ethernet ports? Don’t worry, we’ve got just the thing. 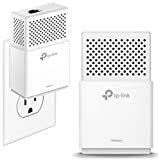 The TP-Link AV1000 Gigabit Powerline Ethernet Adapter Kit instantly transforms any wall outlet into a gigabit Ethernet port, and it uses the electrical wiring that’s already in your house to send and receive data. It’s a fantastic way to get the speed and reliability of wired internet at a fraction of the cost.